40 years of experience in the development of pumps and valves for nuclear power stations have made KSB one of the world market leaders. KSB pumps ensure safe primary and secondary circuits. 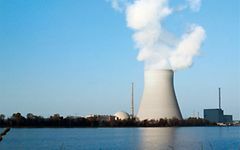 Pumps and valves for use in nuclear power stations comply with international codes. KSB pumps and valves for nuclear power stations offer a consistently high quality. They have been approved under the common codes and standards (e. g. KTA, ASME, RCC-M, TBM/KBM) and comply with quality assurance programmes such as NCA-4000. More to Pumps and valves for use in nuclear power stations comply with international codes. Antimony-free KSB mechanical seals for reactor coolant pumps ensure high plant availability and a low volume of waste material. KSB produces these mechanical seals in its own factories. AREVA, one of the world’s leading energy technology companies, has awarded KSB the title of “TOP AREVA Supplier”. The quality of the pumps was a decisive factor for the award.